The Atlantic Wall (German: Atlantikwall) was an extensive system of coastal defence and fortifications built by Nazi Germany between 1942 and 1944, along the coast of continental Europe and Scandinavia as a defence against an anticipated Allied invasion of Nazi-occupied Europe from the United Kingdom, during World War II. The manning and operation of the Atlantic Wall was administratively overseen by the German Army, with some support from Luftwaffe ground forces. The Kriegsmarine (German Navy) maintained a separate coastal defence network, organised into a number of sea defence zones. Hitler ordered the construction of the fortifications in 1942. Almost a million French workers were drafted to build it. The wall was frequently mentioned in Nazi propaganda, where its size and strength were usually exaggerated. 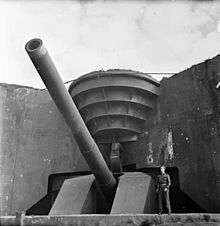 The fortifications included colossal coastal guns, batteries, mortars, and artillery, and thousands of German troops were stationed in its defences. [a] When the Allies eventually invaded the Normandy beaches in 1944, most of the defences were stormed within hours. Today, ruins of the wall exist in all of the nations where it was built, although many structures have fallen into the ocean or have been demolished over the years. World War II in Europe began on 1 September 1939, with Nazi Germany's invasion of Poland. Two days later, the UK and France declared war on Germany. Poland's geographical location, however, prevented the Allies from intervening directly. Four weeks into the attack, the Germans had successfully occupied Poland. Prior to the Atlantic Wall decision, following a number of commando raids, on 2 June 1941 Adolf Hitler asked for maps of the Channel Islands. These were provided next day and by 13 June Hitler had made a decision. Ordering additional men to the Islands and having decided the defences were inadequate, lacking tanks and coastal artillery, the Organisation Todt (OT) was instructed to undertake the building of 200-250 strong points in each of the larger islands. The plan was finalised by the OT and submitted to Hitler. The original defence order was reinforced with a second dated 20 October 1941, following a Fuhrer conference on 18 October to discuss the engineers assessment of requirements. :197 Referring to the “permanent fortification” of the Islands to make an impregnable fortress to be completed within 14 months. :448 Festungspionierkommandeur XIV was created to command the project of fortifying the Channel Islands. It was six months later on 23 March 1942 that Hitler issued Führer Directive No. 40, which called for the creation of an "Atlantic Wall". He ordered naval and submarine bases to be heavily defended. Fortifications remained concentrated around ports until late in 1943, when defences were increased in other areas. This decision required the army engineers and the OT to organise quickly. Massive supplies of cement, steel reinforcing and armour plate would be required and everything would need to be transported. Organisation Todt (OT), formed in 1933, had designed the Siegfried Line during the prewar years along the Franco-German border. OT was the chief engineering group responsible for the design and construction of the wall's major gun emplacements and fortifications. Early in 1944, with an Allied invasion of Nazi-occupied Europe becoming ever more likely, Field Marshal Erwin Rommel was assigned to improve the wall's defences. Believing the existing coastal fortifications to be entirely inadequate, he immediately began strengthening them. Rommel's main concern was Allied air power. He had seen it first-hand when fighting the British and Americans in North Africa, and it had left a profound impression on him. He feared that any German counterattack would be broken up by Allied aircraft long before it could make a difference. Under his direction, hundreds of reinforced concrete pillboxes were built on the beaches, or sometimes slightly inland, to house machine guns, antitank guns, and light and heavy artillery. Land mines and antitank obstacles were planted on the beaches, and underwater obstacles and naval mines were placed in waters just offshore. The intent was to destroy the Allied landing craft before they could unload on the beaches. By the time of the Allied invasion, the Germans had laid almost six million mines in Northern France. More gun emplacements and minefields extended inland along roads leading away from the beaches. In likely landing spots for gliders and parachutists, the Germans emplanted slanted poles with sharpened tops, which the troops called Rommelspargel ("Rommel's Asparagus"). Low-lying river and estuarine areas were intentionally flooded. Rommel believed that Germany would inevitably be defeated unless the invasion could be stopped on the beach, declaring, "It is absolutely necessary that we push the British and Americans back from the beaches. Afterwards it will be too late; the first 24 hours of the invasion will be decisive." The Channel Islands were heavily fortified, particularly the island of Alderney, which is closest to Britain. Hitler had decreed that one-twelfth of the steel and concrete used in the Atlantic Wall should go to the Channel Islands, because of the propaganda value of controlling British territory. The islands were some of the most densely fortified areas in Europe, with a host of Hohlgangsanlage tunnels, casemates, and coastal artillery positions. However, as the Channel Islands lacked strategic significance, the Allies bypassed them when they invaded Normandy. As a result, the German garrisons stationed on the islands did not surrender until 9 May 1945—one day after Victory in Europe Day. The garrison on Alderney did not surrender until 16 May. Because most of the German garrisons surrendered peacefully, the Channel Islands are host to some of the best-preserved Atlantic Wall sites. Many major ports and positions were incorporated into the Atlantic Wall, receiving heavy fortifications. Hitler ordered all positions to fight to the end, and some of them remained in German hands until Germany's unconditional surrender. Several of the port fortresses were resupplied by submarines after being surrounded by Allied Forces. The defenders of these positions included foreign volunteers and Waffen-SS troops. Immediately after the war, there was little interest in preserving the wall due to the negative memories associated with the Nazi occupation. Some of the beach fortifications have toppled or are underwater, while those further inland still exist mainly due to their location. One of the best preserved parts is the Todt Battery. In 2011, renewed efforts to preserve the wall were spearheaded by organisations in Germany, the Netherlands, and the United Kingdom. The question has been raised over whether France should declare the wall a National Monument to ensure it is preserved; however no government so far has envisaged this. Although the defensive wall was never fully completed, many bunkers still exist near Ostend, Channel Islands, Scheveningen, Den Haag, Katwijk, and in Scandinavia (Denmark and Norway specifically). Wikimedia Commons has media related to Atlantic Wall. ^ The coast defence along the North Cape down to the Spanish border, included artillery pieces and naval guns from 105mm to 406mm and were organised into over 600 batteries. In addition, there were over 250 batteries of guns ranging from 75mm to 90mm, including anti-aircraft artillery. ^ a b c d e Lightning War 2009. ^ "History:Fortifying Guernsey". Festung Guernsey. Archived from the original on 9 April 2016. ^ Cruickshank, Charles. The German Occupation of the Channel Islands. The History Press; New edition (30 Jun. 2004). ISBN 978-0750937498. ^ Bell, William. Guernsey Occupied but never Conquered. The Studio Publishing Services (2002). ISBN 978-0952047933. ^ Kaufmann & Robert 2003, pp. 196–197. ^ a b Hakim 1995, p. 161. ^ a b c d Darman 2012, pp. 8–9. ^ Gavey, Ernie. German Fortifications of Guernsey. Guernsey Armouries. ISBN 978-0953163106. ^ Kaufmann, J.E. ; et al. Fortress Third Reich: German Fortifications and Defense Systems in World War II. Da Capo Press, 2007. ISBN 9780306816352. ^ a b c d e f g h i Handbook of the Organisation Todt - part 1. Military Intelligence Records Section, London Branch. May 1945. ^ a b The Great Landings 2009. ^ Mountbatten 2007, p. 72. ^ a b c d e f g h i j k l Overlord 2009. ^ a b c Assault Plan. ^ Ambrose 1994, pp. 221–222. ^ Stephenson & Taylor 2013, pp. 11–12. ^ McNab 2014, p. 197. ^ Stephenson & Taylor 2013, pp. 64–65. ^ Kaufmann & Robert 2003, p. 252. ^ Kaufmann & Robert 2003, p. 14. ^ Zuehlke 2009, p. 527. ^ Saunders 2001, p. 210. ^ Williams 2013, p. 148. ^ Saunders 2001, p. 180. ^ Pauls & Facaros 2007, p. 270. ^ a b c McNab 2014, p. 179. ^ Delaforce 2005, p. 134. ^ Saunders 2001, p. 165. ^ Hastings 2004, p. 158. ^ Prieur, Jerome (2010). Le Mur Atlantique. ISBN 978-2207108802. ^ "Hitler's Atlantic Wall: Should France preserve it?". BBC. 13 September 2011. ^ Williamson 2012, pp. 7–8. Ambrose, Stephen (1994). D-Day, June 6, 1944: The Climactic Battle Of World War II. Simon & Schuster. ISBN 0-671-67334-3. Darman, Peter (2012). The Allied Invasion Of Europe. Rosen Publishing Group. ISBN 978-1-4488-9234-1. Delaforce, Patrick (2005). Smashing The Atlantic Wall: The Destruction Of Hitler's Coastal Fortresses. Casemate Publishers. ISBN 978-1-84415-256-8. Hakim, Joy (1995). A History Of Us: War, Peace And All That Jazz. Oxford University. ISBN 0-19-509514-6. Hastings, Max (2004). Armageddon: The Battle for Germany 1944–45. Macmillan. ISBN 0-333-90836-8. Kaufmann, J. E.; Robert, Jurga (2003). Fortress Third Reich: German Fortifications And Defense Systems In World War II. Da Capo Press. ISBN 0-306-81239-8. McNab, Chris (2014). Hitler’s Fortresses: German Fortifications And Defences 1939–45. Osprey Publishing. ISBN 978-1-78200-828-6. Mountbatten, Chris (2007). Combined Operations: The Official Story Of The Commandos. Read Books. ISBN 1-4067-5957-0. Pauls, Michael; Facaros, Dana (2007). Cadogan Guide Dordogne, the Lot & Bordeaux. New Holland Publishers. ISBN 978-1-86011-354-3. Saunders, Anthony (2001). 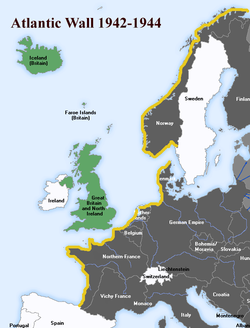 Hitler's Atlantic Wall: Fortress Europe. University of Michigan. ISBN 978-0-7509-4554-7. Stephenson, Charles; Taylor, Chris (2013). The Channel Islands 1941–45: Hitler's Impregnable Fortress. Osprey Publishing. ISBN 978-1-4728-0375-7. Williamson, Louis (2012). U-Boat Bases And Bunkers 1941–45. Osprey Publishing. ISBN 978-1-78200-002-0. Williams, Paul (2013). Hitler's Atlantic Wall: Pas De Calais. Casemate Publishers. ISBN 978-1-84884-817-7. Zuehlke, Mark (2009). Terrible Victory: First Canadian Army And The Scheldt Estuary Campaign: September 13 – November 6, 1944. D & M Publishers. ISBN 978-1-926685-80-9. "Assault Plan". United States Army Center of Military History. Retrieved 22 March 2015. Schofield, Hugh (13 September 2011). "Hitler's Atlantic Wall: Should France Preserve It?". British Broadcasting Corporation. Retrieved 25 March 2015. "Jersey – My Island – History – German Occupation". British Broadcasting Corporation. Retrieved 25 March 2015. Lightning War (television documentary). United States: World Media Rights. 2009. Archived from the original on 2 April 2015. Retrieved 22 March 2015. The Great Landings (television documentary). France: France 2. 2009. Retrieved 22 March 2015. Overlord (television documentary). United States: World Media Rights. 2009. Archived from the original on 2 April 2015. Retrieved 22 March 2015. The Atlantic Wall features in the novel Villa Normandie by Kevin Doherty. The many constructions of the Wall still standing have been photographed by Jonathan Andrew and Stephan Vanfleteren.